Amazon today released a new version of its Kindle e-book reader app for smartphones running the Android operating system. The app's new features include being able to search for words or phrases in the text of an e-book, the ability to add notes to an e-book and synchronize those notes between devices, and integration with third-party services to retrieve more information about whatever you're reading. With this version of the reader, searching text for words or phrases can be performed inside books, both by typing text into a search field or speaking into the phone. Highlighting text will bring up results in Wikipedia and Dictionary.com, all without leaving the app. The new Kindle for Android also features content from Shelfari, a book-themed social-networking site acquired by Amazon in 2008. Without leaving the Kindle app, readers can read book summaries, character details, and live discussions about a book from the Shelfari site. The new Kindle app also adds annotation features that are sure to be useful for students and book-club members: personal notes can be added to pages and passages can be highlighted in books displayed in the reader. Those notes and highlights are automatically synchronized on any other platforms where the book resides. Another key addition is a screen lock, so you can freeze a book in landscape or portrait mode and not worry about its orientation flipping on you unexpectedly. While improved, a few features found on other platforms are missing. 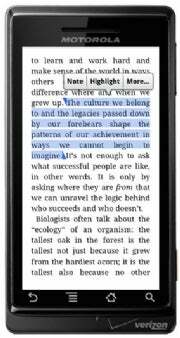 The Kindle app for the iPhone, iPod Touch and iPad supports embedded voice and video clips, points out Lauren Indvik at Mashable/Mobile. In addition, the Barnes & Noble Nook supports navigation in a book by page number. The new app can be downloaded from the Android Marketplace for free. Owners of past versions of the app will receive an automatic upgrade to the new version. "Customers tell us they love the freedom and flexibility of our Buy Once, Read Everywhere approach because they always have their full reading library at their fingertips and never lose their place in a book--whether they are reading on a Kindle or one of their other favorite devices," Amazon Kindle Director Dorothy Nicholls said in a statement. "We're excited to see our customers' positive response to the Kindle for Android app, and we think that customers are going to enjoy the updates we've made."